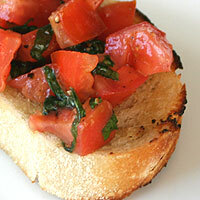 Bruschetta is a simple dish, but can easily go wrong. Even at nice restaurants I've been served everything from soggy-bread to rock hard slices. I like it crisp and able to hold the toppings, with a bit of soft bread inside. 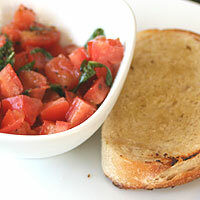 I am posting the classic tomato-basil bruschetta, but bruschetta possibilites are endless. Have fun experimenting! Slice the tomatoes in half. Gently squeeze out the seeds. Chop the tomatoes into small pieces. Set aside in a bowl. Thinly slice the basil and add to the tomatoes. Toss with olive oil, salt, and pepper. Set aside. The seeds in tomatoes are bitter and surrounded by a lot of liquid which will make the bread soggy. Set each piece flat on prepared cooling rack, broil 2 minutes or until the edges start to brown. Flip each piece and broil an additional 2 minutes, or until the edges start to brown. 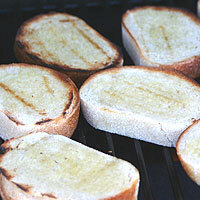 Bruschetta is best when both sides of the bread are crisp. Letting them sit on a cooling rack after cooking will give them adequate air circulation to keep them crisp. Keep slices on cooling rack so the bottom of the bread doesn't get soft. Drain excess juice from the tomatoes. Top each piece with the tomato-basil mixture and serve immediately. Or serve with the tomatoes and basil on the side. 1. Slice the tomatoes in half. Gently (1)squeeze out the seeds. Chop the tomatoes into small pieces. Set aside in a bowl. Thinly slice the basil and add to the tomatoes. Toss with olive oil, salt, and pepper. Set aside. 2. Preheat oven broiler or grill on high. 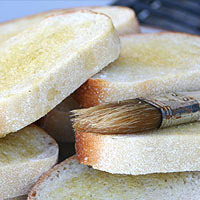 Slice the bread into slices 1 inch thick. Crush garlic into the oil. 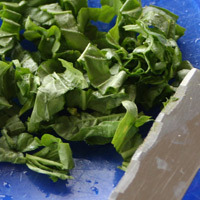 Brush both sides with the oil-garlic mixture. Place a (2)cooling rack on a jelly roll pan and set aside. 3. Keep slices on cooling rack so the bottom of the bread doesn't get soft. Drain excess juice from the tomatoes. Top each piece with the tomato-basil mixture and serve immediately, or serve with the tomato mixture on the side. 1. 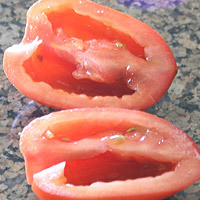 The seeds in tomatoes are bitter and surrounded by a lot of liquid which will make the bread soggy. 2. 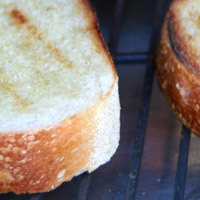 Bruschetta is best when both sides of the bread are crisp. Letting them sit on a cooling rack after cooking will give them adequate air circulation to keep them crisp.